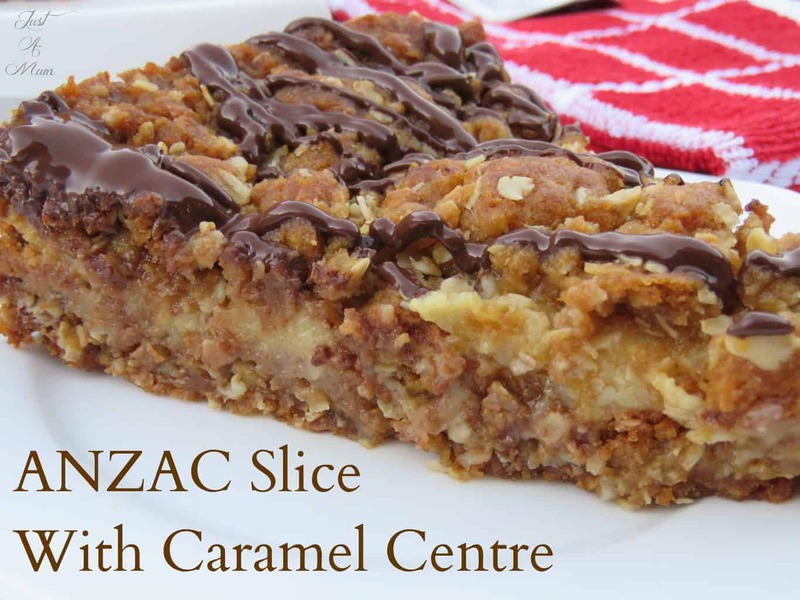 Just when I thought this Anzac slice couldn’t get any better someone suggested adding a caramel centre and I knew I just had to give it a try and WOW it definitely was a great idea!! 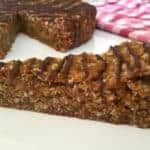 This recipe, like many on my page should coming with a little warning, it is sweet, it is rich and it is NOT going to be given the healthy tick! But boy is it divine and absolutely worth trying whether for Anzac day or just any other special occasion during the year. 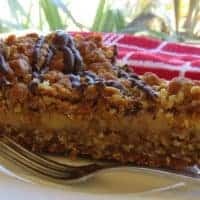 My Anzac Biscuit recipe became my popular Anzac Slice recipe and this year I have given it yet another twist of deliciousness. 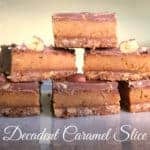 I have used the easy Caramel filling from my Caramel Slice so took inspiration from what I knew would complement this beautiful slice. 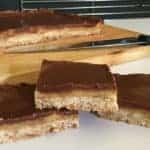 I was not sure if the topping would cover the entire caramel filling, but even if it doesn’t when you make it, because all the textures and flavours work so well together it really doesn’t matter! For those not in New Zealand or Australia Anzac day is commemorated on the 25th of April each year. This day remembers the Australian New Zealand Army Corps and their service in World War 1. We remember our soldiers who served each year with a public holiday and commemorative services held across both countries with the red poppy being the symbol of this day of remembrance. So without further ado onto the recipe. 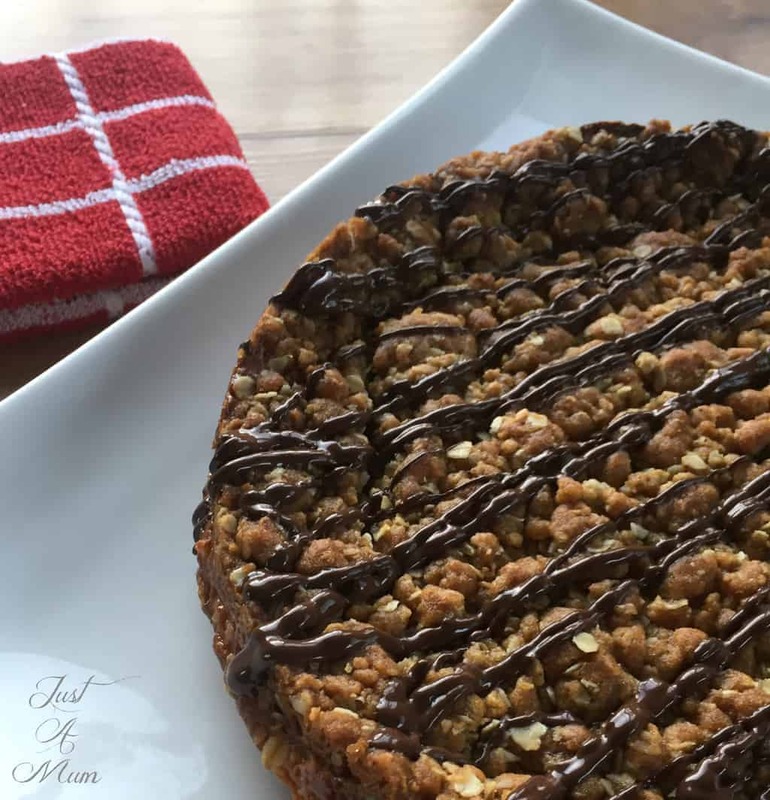 It is easy to whip up, I have simply topped it with a little melted chocolate, it really does not need anything further, you could even leave it out but it adds to the taste and a little prettiness! Prepare a 25cm spring form tin with cooking spray or generously wipe with melted butter over all the surfaces. 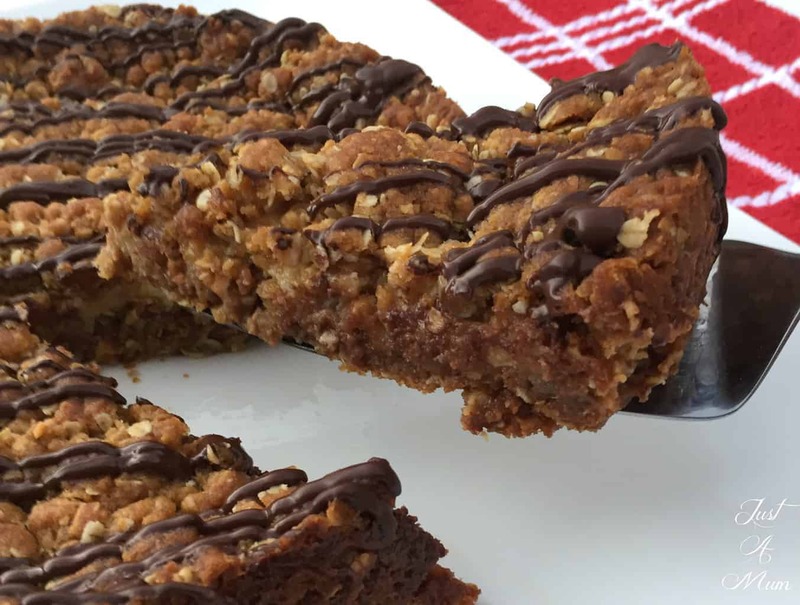 In a large bowl combine the Flour, Brown Sugar, Rolled Oats and Coconut, ensuring all the ingredients are well combined and no lumps of sugar remain and set aside. In a medium saucepan heat the Butter on a low temperature until completely melted, to this add the Golden Syrup and the water and whisk until blended through and remove from the heat. Add the Baking Soda to the butter mixture and whisk until all dissolved. Make a well in the middle of the dry ingredients and pour in the melted butter mixture. Mix well to combine with a strong spoon. In a small saucepan or pot combine condensed milk, butter & golden syrup. Stir over a low to medium heat for 6-8 minutes, until mixture boils, thickens and changes to a slightly darker colour - it may catch so take care to stir constantly. 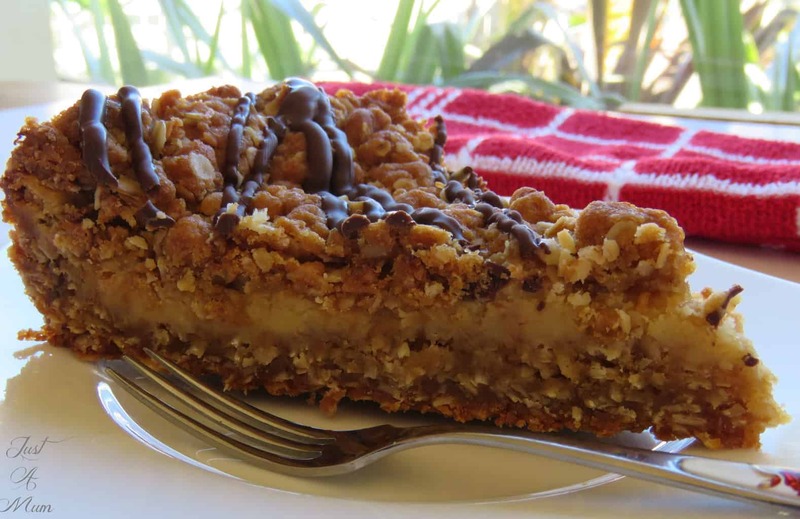 Sprinkle the remaining slice crumbs evenly over the top of the caramel, then press this down with your palms until even. Bake the slice for 20-25 minutes until golden brown, the slice will firm up upon standing. Remove from the oven and allow to cool in the tin for 15-20 minutes. Gently run a knife around the edges before carefully removing the spring form tin. To remove the base simply use two wire racks one on top and one underneath to flip the slice and carefully peal off the base then invert back to the right way up using the same method! Melt the chocolate chips and oil in a small microwave proof bowl, 20-30 seconds at a time stirring each time until completely melted. You can either flick the melted chocolate over the slice off the end of spoon, or as I did add the melted chocolate to a small ziplock bag, then cut a tiny 1-2mm corner of the bag off and you have an easy piping bag! Then flick back and forward quickly over the slice - good tip is to do this over newspaper or you will make a mess like me! 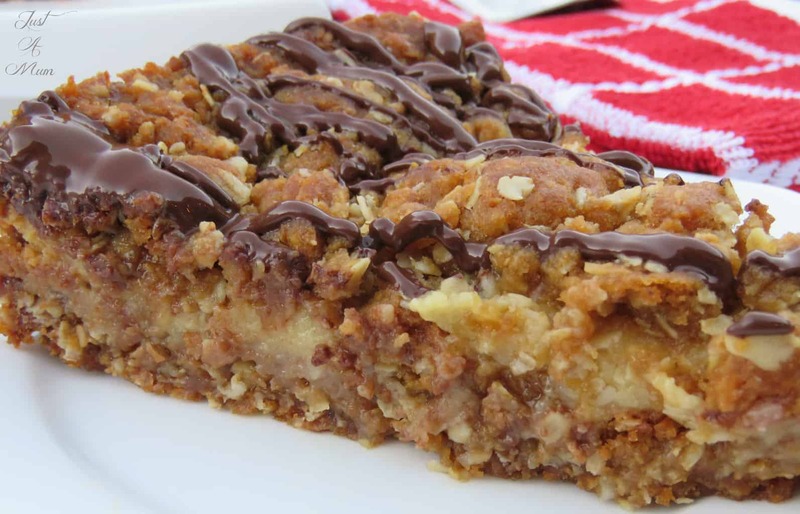 I hope you enjoy this delicious recipe! It is such a decadent one, but I just know you will love it. Check out this quick video to see just how easy it is! If you are not already be sure to follow me on Facebook for more deliciousness and Instagram to see a little more behind the scenes of our family and what we are up to.